The Apple MacBook Pro 13-inch, space gray, 2016 uses a better processor than the MacBook Air 11-inch, Summer 2012: Intel Core i5 (6th Gen) 2 GHz clock speed versus Intel Core i5 (3rd Gen) 1.7 GHz clock speed. It is very important advantage of this model as powerful processor will show better performance. The MacBook Pro 13-inch, space gray, 2016 is equipped with more memory 8 GB LPDDR3 SDRAM than 4 GB DDR3L SDRAM of the MacBook Air 11-inch, Summer 2012. It means that the Apple MacBook Pro 13-inch, space gray, 2016 will handle more number of running applications at once. The Apple MacBook Pro 13-inch, space gray, 2016 is equipped with a better WQXGA display resolution that will let you to enjoy working with design applications. The MacBook Pro 13-inch, space gray, 2016 uses a 256 GB SSD, flash storage, flash storage, flash storage, flash storage, flash storage, flash storage, flash storage, flash storage, flash storage, flash storage, flash storage which is larger than 64 GB SSD, flash storage, flash storage, flash storage, flash storage, flash storage, flash storage, flash storage, flash storage, flash storage, flash storage, flash storage of the MacBook Air 11-inch, Summer 2012. 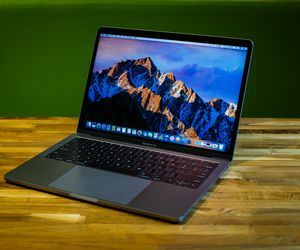 The Apple MacBook Pro 13-inch, space gray, 2016 has a better Intel Iris Graphics 540 graphics card that will let the notebook to run more number of modern games. The MacBook Pro 13-inch, space gray, 2016 has a better battery life as it is produced with 54 Wh battery which is 19 Wh bigger in comparison to the MacBook Air 11-inch, Summer 2012 cell. That's mean this model can be used for a longer time without charging. The MacBook Air 11-inch, Summer 2012 weighs 2.38 lbs which is 0.64 lbs lighter than the weight of the MacBook Pro 13-inch, space gray, 2016. The MacBook Pro 13-inch, space gray, 2016 has 8 advantages and the MacBook Air 11-inch, Summer 2012 only 1 so the MacBook Pro 13-inch, space gray, 2016 will be the best choice. Check the list of the best offers on Amazon .